"My First Tattoo" is made in 300 dpi with the background papers measuring in at 3600 x 3600 pixels. 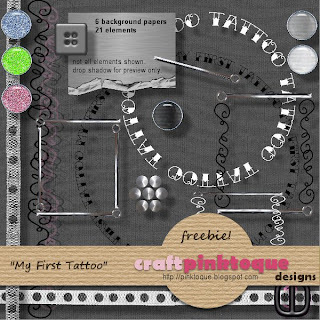 The mini kit includes 6 background papers and 21 elements. Stay tuned -- with all of these freebies I need to take some time to actually put together the layout ideas I have in mind for them and scrap my own stuff to share. If you make any cool layouts with any of my freebies please do share by sending me an email or commenting and linking me... I'd love to show them off here, too! The download can be found HERE (zip file), and a note when you nab it here on my blog would be great :) Thanks and enjoy! Thank you! Your blog post will be advertised on the DigiFree Digital Scrapbooking Freebie search engine today (look for timestamp: 13 Jul [LA 12:09am, NY 02:09am, UK 07:09am, OZ 05:09pm]). My daughter will be getting her first tatoo next month in memeory of her brother. If I can decide by then what memorial tatoo I want it just might be a mother daughter day. Anyhoo, thank you for the kit, it will work great to remember the day.